Essenza Mini Espresso Coffee Machine + Aeroccino £1 Plus £25 of Credit PM at Nespresso Save £138.99! You can unleash your inner barista with Nespresso, the creator of those iconic coffee capsule machines which adorn the kitchen shelves of homes and even businesses everywhere. Each of the uniquely designed Nespresso machines is engineered to be smart and user-friendly so that everyone can enjoy an enchanting Nespresso moment. Stylish, they are created in striking colours and ergonomic designs - whether you need a compact model or have room for a little more intricate expertise - each will blow you away with innovative features. Some can even connect to your Nespresso app, letting you personalise your every drink. So if a decaf, medium-roasted espresso blend macchiato is all that’ll get you out of bed - you can go there with Nespresso. Bringing you the best in coffee, you’ll find a range of coffee bean roasts and aromatic profiles to suit your personal preferences. Working with the Rainforest Alliance too, Nespresso takes a strong stance on sourcing the best quality coffee from reliable and fair trade suppliers so that you’ll get pure excellence from every cup. Plus it’s easy to keep your machine looking fine and in great working order too with the abundance of accessories and help available online. From descaling kits to sweet treats to accompany your favourite concoctions - Nespresso has mastered coffee like no other. How do I use my Nespresso promotion code? Proceed to pay with your savings. Create an account with Nespresso and being a club member will entitle you to many a starry benefit. Can I recycle my Nespresso capsules? It’s easy to recycle your used Nespresso capsules, simply fill your recycling bag and drop it off at a convenient Collect+ or Doodle location. Can I track my Nespresso order? On placing your order, you will receive an email with a tracking link so that you can see where your package is. Where is my nearest Nespresso boutique? You can use the store locator to find one of the stunning Nespresso Boutiques near you. Next Day Delivery costs £4.95 or is free on all machine and 200+ capsule orders. You can also pick your order up from a Nespresso boutique or Pick up Point (1-2 days), there are plenty more delivery options online. Happy to refund or exchange purchases, call 0800 442 442 / 1800 812 660 to arrange a return and be sure to send your goods back in their original condition within the 14-day period. Email Nespresso using the contact form. Nespresso was created with the gourmet coffee connoisseur in mind. The original makers of the evolutionary coffee capsule, every coffee pod is filled with flavour and delight. 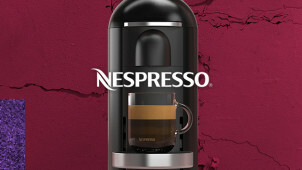 Now you can make a quality investment with a Nespresso voucher code to save on a very stylish coffee machine indeed. With more than 24 Grand Cru coffee varieties to choose from, whatever your aromatic profile may be, Nespresso will have the perfect pod for you. There’s a Nespresso app that you can download from the Apple Store or via Google Play. Letting you access the Nespresso boutique while you’re on the move, you’ll be able to charge up your home with coffee capsules and all the accessories you need. You’ll even be able to make that first precious investment of a stylish Nespresso machine whenever the moment takes you! Nespresso has produced many a fancy coffee machine, and continues to create sleek and innovative models to tempt every person, including the likes of George Clooney. Discover a classic Lattissima machine with integrated milk frothing functions and you’ll conquer your cappuccino like you've never done before. A Nespresso promo code will let you save on the Lattissima Touch or the Pro model. When the quality of these machines is much like that of a professional coffee maker, you’ll be able to create anything on your favourite coffee house menu, from the comfort of your own home.